Happy New Year! Starting the year off strong with another review. A few months ago, I reviewed the Mattel Deadshot 6″ action figure before the movie (see here). To put it bluntly, I was not impressed. 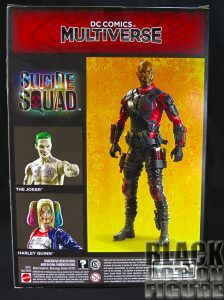 It what seemed to be the bare minimum, Mattel gave us a bland, almost sadly gratuitous action figure to go with the substandard, and overall terrible Suicide Squad movie. This time around, I’m reviewing the 12″ figure also from Mattel. From first looks, nothing special, but do not pay full price for it if you can wait. With all of the inventory I see, I believe it will be in Ross/Marshalls/TJ Maxx by spring of 2017. 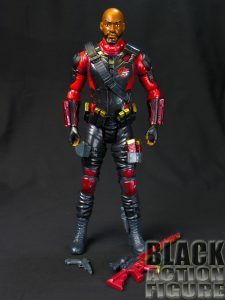 As of this writing, Amazon has this figure for $12.64, about $5 cheaper than its 6″ counterpart. The box is not as appealing as it thinks it is (or at least what the executives at Mattel thinks it is). It serves it’s purpose of delivering a 12 inch figure to the consumer. It has the character’s name and image. It looks like the bigger brother to the 6″ figure packaging. Other than that, it is extremely boring. Nothing really makes me want to pick up this box. If I see it in the store, I really don’t care to see behind it to see if there are other figures. On the back of the packaging, we do see that other figures do(did) exist. 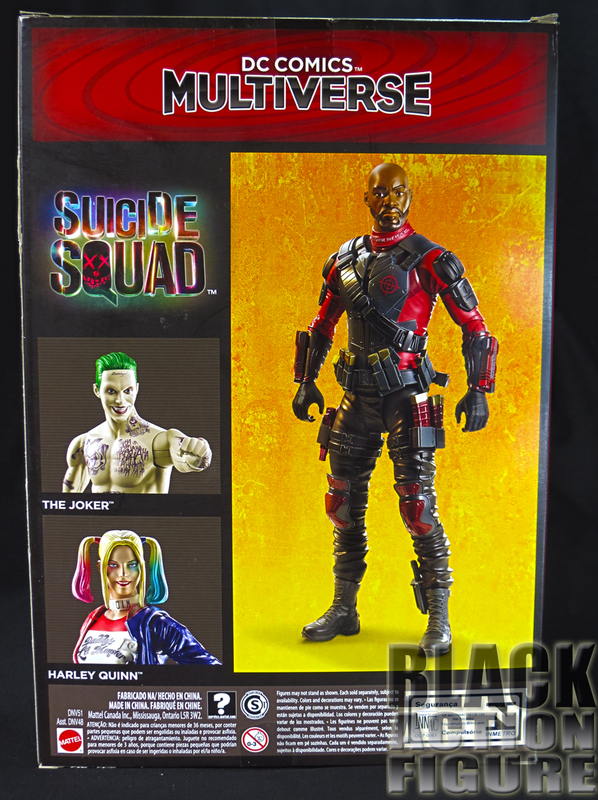 Along with the over-hyped, over-marketed Deadshot figure, we get the over-hyped, over-marketed Joker and Harley Quinn figures. No thanks Mattel. 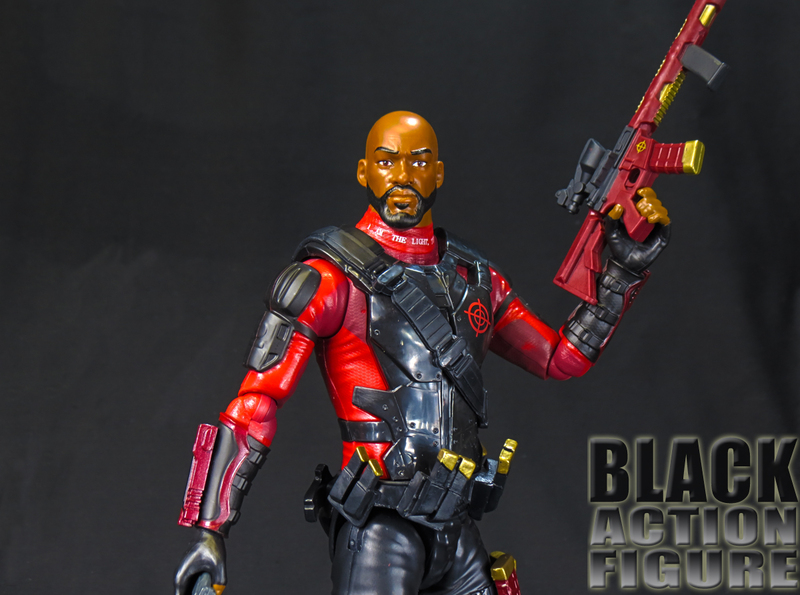 I barely wanted to get Deadshot. So the packaging altogether is pretty much a giant fail. It serves to get the product to the buyer. That’s about it. At least I can see that the 12″ figure is going to get 2 weapons instead of the pitiful one weapon that the 6″ figure got…and the extra head…it must be hidden from view, right? 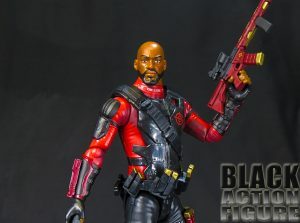 When I first saw this figure, I was like “finally, a Deadshot with more than one flimsy gun.” Then I opened up the package. I pulled out the figure. I pulled out the pistol. I pulled out the rifle. Okay, so where is the extra head? Did it fall out? Are you freaking kidding me? 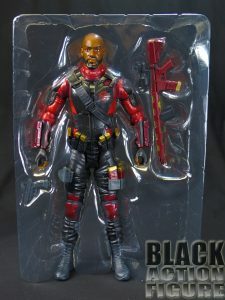 You just sold me a Deadshot that has no “Deadshot” head? How the hell did that happened? 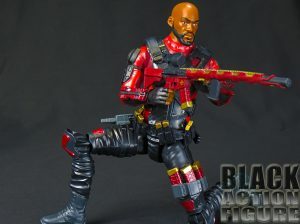 Wouldn’t that just be Will Smith dressed up in a red and black jump suit and armor? Really, how did Mattel eff that one up? First the good (kind of). The pistol is not a floppy P.O.S. like the one that comes with the 6″ figure. But it has not paint application whatsoever. It’s just a gray piece of plastic with no paint detail. Sad. The rifle on the other hand is pretty detailed with a nice red and gold paint application it’s pretty solid and fits tight in the hand, but it fits. However, it looks less like a rifle and more like a nerf gun on steroids. Now the bad. It looks like the figure is loaded with accessories…but all of them are permanently attached to the figure. How disappointing it is to see a figure loaded down with stuff that you will never be able to detach and use. This is a tough one in terms of likeness, so I’ll start with the sculpt. For what you are paying and getting, the sculpt is pretty nice. Lots of details in the suit (including non-detachable accessories). 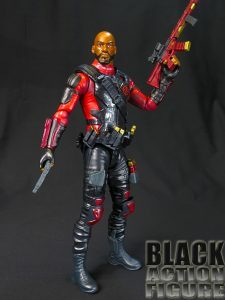 Even the target logo on the figure’s chest and the distorted Bible scripture on the figure’s turtleneck are pretty well done. 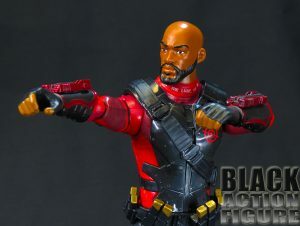 As far as the likeness goes…this is what I imagine Will Smith would look like if I only paid $15 or less for the figure…which I did. In certain angles, this is Will Smith. In others, it’s almost a weird caricature of the man. 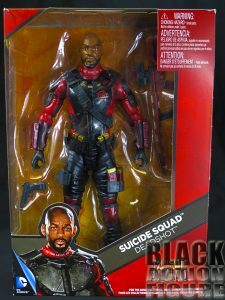 It’s almost like this would be the action figure for the Will Smith likeness portrayed in a cartoon version of Suicide Squad. So I guess I’m saying it looks like a cartoonish/comic book like Will Smith. Which is not bad. It could have been terrible and just like some random bald headed Black guy with a beard. But for what it’s worth, it is a good likeness. Everything however is not perfect. Since the whole figure is plastic, that’s what it looks like…a big chunk of plastic. Nothing looks substantial or solid on this figure and that is accentuated with the fact that when you pick it up, it feels hollow. That’s a no go on realism. I have to say I’m honestly surprised in this category. This figure comes with 18 points of articulation…seriously about 10 more points than I actually expected. For such a cheap inexpensive figure, I’m happy that Mattel saw fit to put in so much. 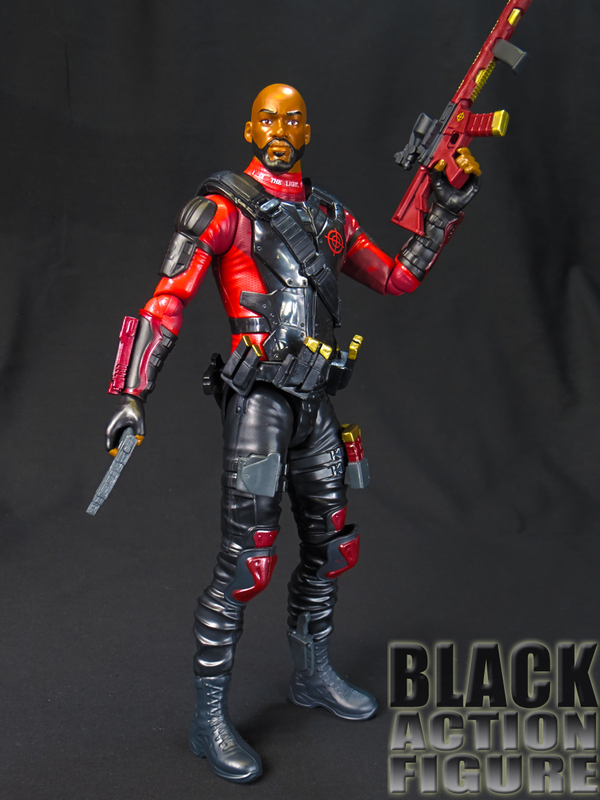 In comparison, the Hasbro 12″ Falcon I reviewed came with a whopping 7. 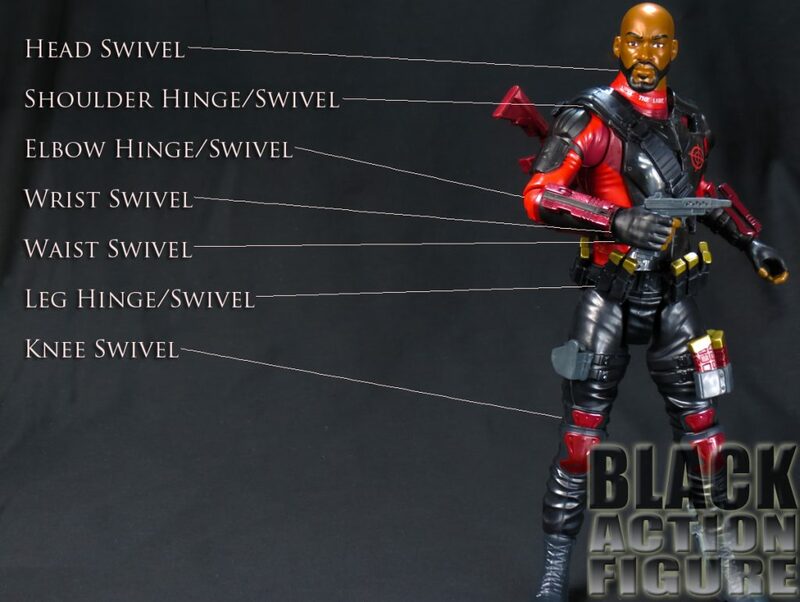 I almost see why Mattel would want to charge a little more for their figure…you can actually pose it. With Hasbro steadily taking away articulation from their figures or charging more for more articulated ones, I’m glad Mattel found a way to creatively put in some of this articulation. Even with the high articulation, there are still some limitations. There is no articulation below the knees, so some stances are awkward. The figure does not look up or down which I feel should be a standard nowadays. And since the rifle is so big, the arms could have had either more articulation or more accessible articulation in order to hold it. Other than that I always like to score the articulation versus what we are actually looking at. 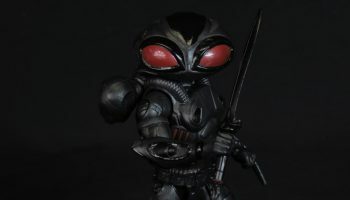 Meaning we know this isn’t a Hot Toy, so I won’t score it on that scale. 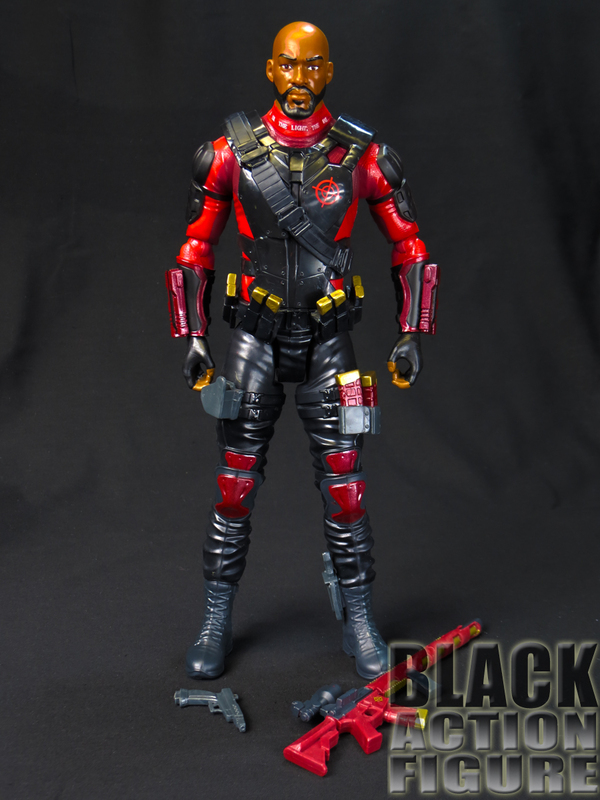 But compared to other 12″ figures (outside of the newer 12″ Marvel Legends) this actually is pretty decent. 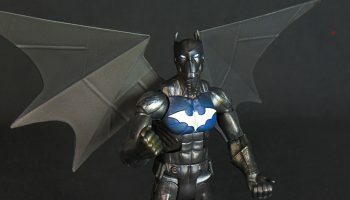 I still say it is pretty unforgivable for Mattel to leave out something so important as part of a figure’s costume. It’s almost like buying a Batman with a Bruce Wayne head, but no actual Batman head. Would kids want to play with that toy? Would adults necessarily want that displayed? Yes, it was Will Smith that sold this character. 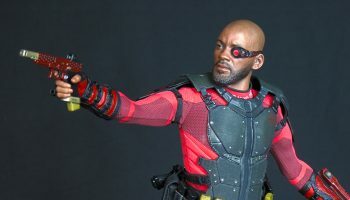 It was the fact that Deadshot was played by Will Smith that I felt compelled to include him on this site. But don’t sell me a Deadshot figure and give me a partially designed Will Smith figure. It’s unconscionable (I can’t believe I not only used this word right, but spelled it right on the first try too…). 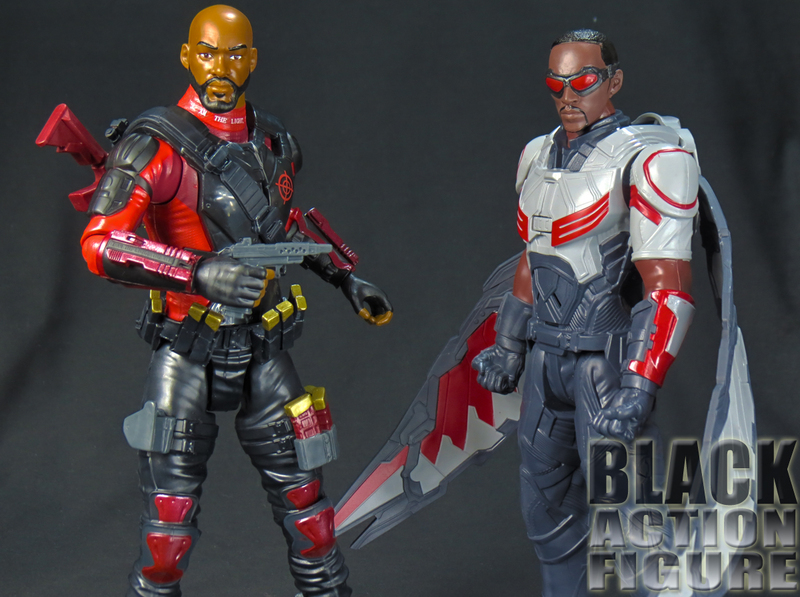 Seeing these two figures together on the left (Deadshot and Falcon), it’s honestly not a bad look. But be real, these will never replace my figures in my 1/6th collection anytime soon. They are really lucky they are even getting any shelf space.